..: Consultancy Projects - Building Industry : Heating and Ventilation Studies :..
Computational Fluid Dynamics has become a standard design tool for the building services industry. New ventilation systems can be quickly assessed and external factors, such as sunlight through windows and heat loss through walls, can be readily superposed on to the model system. Rose Consulting have performed a number of studies for clients ranging from small-scale local heat transfer problems through to safety and hazard assessments for gas releases in large buildings. Some of the issues relating to these projects are reviewed here. The main operations room of a new air traffic control centre houses over 50 people and their associated computer terminals. A large viewing window is located at one end of the room. In this design, a floor located forced flow ventilation system is proposed as a means of maintaining a comfortable working environment. Rose Consulting used a CFD model that included thermal sources for sunlight, computer terminals and the roof lighting to show that the temperature distribution in the building remained stratified and within acceptable bounds for this ventilation system. In addition to a model of the main operations room, a number of sub models were used, to assess local conditions around individual terminals. Figure 2. Velocity plumes rising from local terminal heat sources. 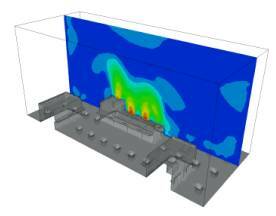 In another study, Rose Consulting used CFD to examine the detailed distribution of flammable gas in a process plant equipment room. The gas was introduced into the model at point source locations, representing leak paths, and modelled as a dense plume. Concentrations were found to be well above the Lower Flammability Limit (LFL), where the safety guidelines stipulated that the concentrations should not exceed 25% of the LFL. Additional forced ventilation near the leak sources was proposed, tested with further models and shown to remove the problem. This work formed part of the client's operational safety case delivered to the regulatory authorities. Figure 1. Isosurfaces of temperature in the main operations room of a proposed air traffic control centre. Temperature stratification is observed with the largest heat load at the window surface.